Reclaimed wood is everywhere. You know the saying, what’s old is new again. And, when it comes to decorating with reclaimed wood that’s an understatement. From wall hangings to lighting to bar carts to book shelves and shelving units, floors and more, there’s no stopping this trend. If you aren’t familiar with reclaimed wood, it is made from timbers that have had a previous life. The mystique of the wood is in its unique history. The timbers can be rescued from a variety of sources. The most common sources are old barns and factories, bridges, shipping crates, boat yards, and warehouses. Less traditional timbers are repurposed from old boxcars, coal mines, and wine barrels. The colors and patterns of the wood can vary greatly. For me the beauty of reclaimed wood lies in its imperfections. Every knot, split, and nail hole adds unique charm and character. The wood is also more durable and stronger than younger trees that contain more moisture as a result of the presence of sapwood. Though rustic in nature, you can mix reclaimed wood furniture into a variety of decorating styles. To create a one-of-a-kind look mix the wood with farm style, industrial, modern, and contemporary styles. The possibilities are endless. 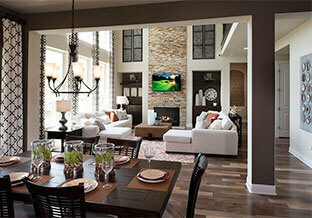 And, when it comes to decorating your new Travisso home it is all about making a statement. Reclaimed wood adds warmth, ambience, and interest to any room in the house. Furniture pieces typically made from the wood include benches, chairs, coffee tables, side tables, dining room tables and chairs, headboards, and chests. In addition, reclaimed wood is also used for architectural interest in both new and antique buildings and houses for staircases, beams, trusses, flooring, and fireplace mantles. Whether you chose one focal piece or a few for the inside of your home, don’t forget about the outside. It works perfectly in a garden setting too. So, you already know what reclaimed wood is. But, what about salvaged wood? In its purest form salvaged wood has never been cut or used for construction purposes unlike reclaimed wood and is harvested from fallen trees. Before the recent surge of salvaged wood products these trees would have been discarded in our country’s landfills. Using these products in building construction and most recently in the design of furniture has had a tremendous impact on our environment. Both are environmentally friendly and make great “green” building products. In addition, using these woods saves space in our country’s landfills, and preserves trees, one of our earth’s most precious resources. With its recent popularity and desirability Austin area retailers, small business owners, and craftsmen are carrying quality products. Shop these Austin area retailers: Endever Furniture and Design, The Khazana, Jaya Furniture, and Nadeau Furniture with a Soul for unique finds and one-of-a-kinds. Or, a place that you might not think of going to is a Habitat for Humanity Restore. There are several in the area including a Williamson County location in Round Rock.